Orders shipped within the continental U.S. that total $195 or more are shipped for free. Shipping is $9.50 for orders shipped within the continental U.S. that total less than $195. We do not allow returns or cancellations of orders. This applies to both in-stock and pre-ordered items. However, if a pre-ordered item is delayed more than 60 days past our published release date, you may remove that item from your order with no penalty. Orders over $1000 receive a 4% discount. Shipping costs do not count towards $1000. Discounts do not apply to case prices or to special price quotes. If you order a case and your order exceeds $1000, you will receive the lower of either the case price or our regular box price minus the discount. Credit Cards: We accept Visa, Mastercard, Discover, JCB, and American Express with no surcharge. Bank Wire: Your order will be shipped once receipt of wire has been confirmed by our bank. Minimum order for this payment method is $1000.00. Send-in Payment: If you pay by money order or cashiers check, we'll ship your order as soon as we receive payment. If you pay by personal check or business check, we must wait 14 days for the check to clear before we ship. Please mail payments to Potomac Distribution, 43760 Trade Center Place #145, Dulles, VA 20166 USA. We require a 10% deposit when you buy pre-order products. Please note that this is only a deposit and not an extra charge. When we collect a 10% deposit, you will only be charged for the remaining 90% when your order ships. In the event that the manufacturer cancels the pre-ordered product, we will refund all deposit payments. If there are in-stock items and pre-order items on the same invoice, the entire invoice will be shipped once all of the pre-order products arrive. To avoid this situation, please place separate orders for each shipment that you want. If you have already ordered and would like us to split your order into separate shipments, please email us. Keep in mind that if you are an international customer or if you are in the US but have requested shipping by overnight, 2-day, 3-day, or Priority Mail service, your total shipping costs will increase simply because it is always cheaper to send one large shipment than two small ones. Continental US: Shipping is free for all orders of $195 or more shipped within the continental US. Shipping is $9.50 for orders that total less than $195. 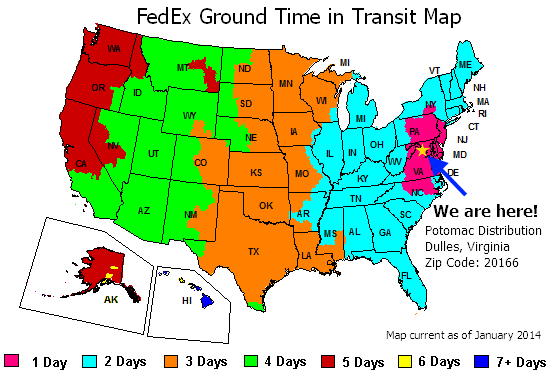 APO/FPO, Hawaii, Alaska: We use Priority Mail to ship to these locations. Shipping charges will be added to your order. Our website will compute the exact shipping charges when you place your order. International: We have excellent rates for several fast shipping options including FedEx's International Priority service (2-5 days), FedEx's International Priority (3-10 days), and DHL's Express service (3-6 days). We also offer international shipping via USPS Priority Mail (14-21 days) and USPS Express Mail (3-10 days).Click here for international rates. Virginia: 6.0% Virginia state sales tax will be added to your order. Other US States: We do not charge sales tax for non-Virginia residents. Other Countries: We do not charge any sales tax to foreign customers. HOWEVER, it is likely that your country's customs office will charge import tax, duty, VAT/TVA, or all three. If you are not familiar with your country's importing laws and taxes, we encourage you to contact your local customs office before you order. Please do not ask us to undervalue your package for customs purposes.